As we reach the final stretch for launching our exhibit “Patient No More: People with Disabilities Securing Civil Rights” that opens at the Ed Roberts Campus in July, I’ve been consumed with a burning question: what would I have done? Would I have gone in to occupy a federal building for 26 days with over one hundred people I didn’t know, disabled people? Could I then or now sleep on the floor, bathe in a sink, eat food brought by strangers, live with crabs and who knows what else, for nearly a month? Would I have resisted the siren song of friends and family, clueless about disability politics as they gently mocked me about a cause I didn’t yet know enough about to believe in? Kitty Cone, who to everyone’s great sadness died on March 21, was a central figure in the Section 504 Occupation of San Francisco’s Federal Building back in April 1977. She understood the deep connections between personal activism and political change. She could explain in basic ways how individual people could make a difference by insisting that President Jimmy Carter’s administration come through on a promise they’d made to sign legislation that had been languishing for four years, Section 504 of the 1973 Rehabilitation Act that would guarantee people with disabilities their civil rights. And she knew how to build bridges between various local community groups and leaders who could support the protesters inside. Her persuasiveness and carefully-crafted alliances helped ensure the success of 504 and ultimately helped pave the way for passing the Americans with Disabilities Act (ADA) in 1990. In April 1977 I was an awkward kid in college at UC Santa Cruz, excited about my upcoming junior year abroad in France. I didn’t know any other disabled people, because I didn’t want to. My community was friends from my dorm. We had in-jokes and talked late into the night about our classes, our professors, our families, each other, the crappy dining hall food, our hopes for the future. I’d like to think of myself as political, but I wasn’t. I was just an insecure gal looking for myself and hoping people would like me or at least not taunt me like they had for most of my life about my “weird eyes.” I didn’t know to think of what we today call “bullying” as political, as part of a bigger civil rights struggle. Given how much time I spent secluded in my dorm room struggling to read the small print in my books for class as I hid (from) my vision impairment, little wonder that I had no idea that a revolution was taking place just 75 miles away up in San Francisco. What if I’d met Kitty back then? Many of the people we have interviewed for “Patient No More” described her as the one who urged them in and gave them strength. 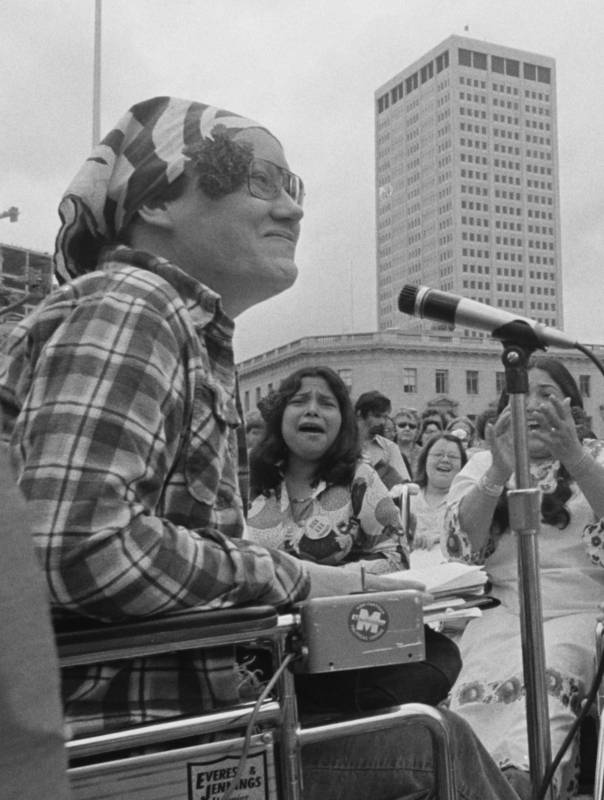 Her activism extended far beyond strategizing a revolution of disabled people: there was something deeper, something about her that made you feel part of something bigger, gave you a sense of purpose that was profound, real, full of conviction. I often fantasize that if I’d met Kitty Cone in 1977, I would have marched right in, claimed my identity as a person with a disability and taken my place in history. But the truth is, I’m not sure I would have been ready. Yet Kitty made me a revolutionary. Rather than awaken a future me, our talks thirty-five years later put me in touch with that scared Cathy on the threshold and accept that college kid for who she was: someone poised for a new adventure where she’d live in a foreign culture among people who didn’t speak her language. I was about to occupy my own building back then, laying the groundwork for the activist I would become. The remarkable thing was that Kitty taught me this without our actually having spoken of it. She understood something about activism that never gets acknowledged: it is as much about extending tools to draw strength and integrity from a painful past as it is about charting the future. To celebrate Kitty, the Longmore Institute has compiled a video from clips of our extensive interview with her for “Patient No More.” The video is captioned and audio-described. To learn more about “Patient No More” that will be at the Ed Roberts Campus above Ashby BART in Berkeley from July 26 - December 18, go here.